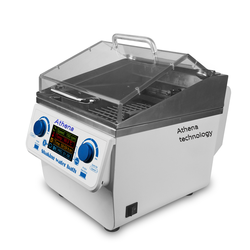 Product description: Athena water bath shaker is a temperature controlled thermostat water bath and oscillator combined biochemical equipment, mainly applicable to colleges and universities, medical, petrochemical, health and epidemic prevention, environmental monitoring and other research departments for biological , Biochemical, cell, bacteria and other liquid, solid-state chemical oscillation. It is an indispensable laboratory equipment for precision cultivation of plant, biology, microbe, genetic virus, medicine, environmental protection and other scientific research, education and production departments. 1、Unique and novel appearance, small size, powerful functions. All surfaces in contact with water are made of high-quality stainless steel and are corrosion-resistant. 2、TFT LCD holographic displays operating speed, temperature, time. Graphic dynamic symbols and precise data at a glance. 3、Built-in chip memory storage mode, memory 9 kinds commonly used combination of parameters, and can achieve single-node cycle or multi-node pulse cycle. To meet more experimental requirements. 4、Using microcomputer program PID automatic temperature control, with a good temperature uniformity, high temperature control accuracy, safety and comprehensive protection features. 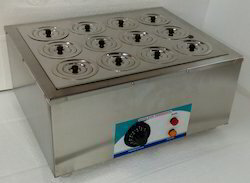 5、Oscillation and heating using split design, the moving frame can be taken out when it does not do not need to oscillation, canbe usedas a constant temperature water bath box, a dual-purpose machine. 6、DC motor, low noise, maintenance-free, long service life. 7、Transparent clamshell design, easy to operate, real-time observation of the internal operating status. The Water Baths are Double walled thermostatically controlled inside made of stainless steel outer made of S.S. / M.S. duly powder coated. Gap between the walls is filled with glass wool. S. S. Tubular Heaters for maintaining of temp. Solid State Electronic Digital Temp. Control Panel housing all the control switches with PT – 100 sensor. Models available as per GMP, Complete S.S unit, Strip Chart Recorder. Microprocessor based PID temp. Control with printer interface, RS 232 CPC, RS-485 interface for multiple networking of controller. Validation Protocols for IQ OQ PQ & DQ complete documentation with reports, Calibration & Test Certificate traceable to National & International Standards. A suitable K.V.A. servo controlled voltage stabilizer is recommended. Double walled with Inner SS – 304 grade Exterior MS Powder Coat finish. High Density glass wool insulation in between the walls to minimize the heat loss. Heating by 'U' type SS Immersion Heater. Concentric rings to use flask from 50ml to 500ml capacity. Temperature controlled by Capillary Thermostat with +/- 2° C accuracy. Temp. Range: - 5°C Above ambient to 99°C. A. Dual Display Microprocessor based PID Temp. Controller with PT-100 Sensor. Temp ranges from 50 °C to 300 °C ± 5 °C. 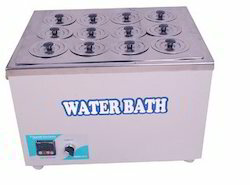 Oil baths are ideal for reactions, extraction, analysis & other lab tests. Leak proof argon welded Inner made of Stainless Steel – 304 grade & Exterior made of CRCA Steel -powder coat finish. Inner tank of Stainless Steel – 316 grade & Body made of Stainless Steel – 304 grade Matt finished. Walls contain High density glass wool insulation to minimize the heat loss. Temperature controlled by Capillary Thermostat with +/- 2°C accuracy. Temp. Range 5°C Above ambient to 300°C. 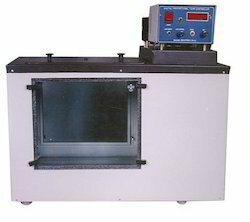 Serological Water Bath, is double walled filled with high grade glass wool insulation between the two chambers. 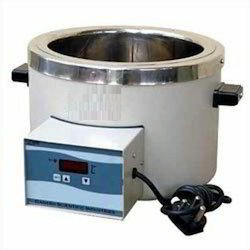 Outer chamber of serological water bath is made of mild steel with powder coating and inner chamber is made of stainless steel. Temp. controller by thermostatic Temp. Range varies 5°C above ambient to 60°C. Inner chamber and top lid (pyramidal) made of S.S.
Gap between the walls filled with glass wool insulation to avoid the heat loss. Temperature range 5oc above ambient to 60oc with Accuracy: ± 2oC. Long casting heating element. To operates on 230 Volts A.C. Only. 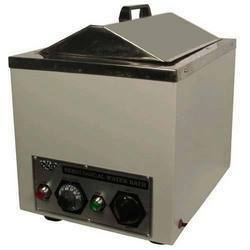 Looking for Water Bath ?